The BedJet Climate Comfort System takes a creative approach to helping you – and your partner – stay cooler or warmer in bed. The unit uses a stream of air to cool or warm your bed. You can also use their AirComforter for an even more enjoyable experience. Overall, I was pretty happy with how well the BedJet kept me cozy and comfortable through the night. Read on for my full review. 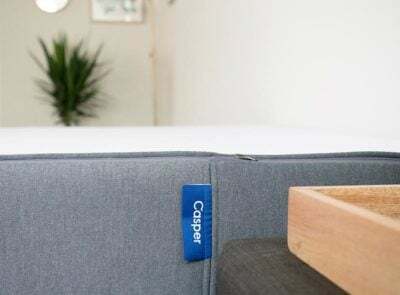 The BedJet Climate Comfort System is designed to cool and heat your bed using a quiet stream of air directed at your bed. 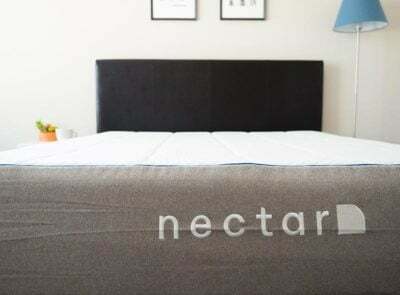 Instead of purchasing bedding with phase change technology that absorbs and releases your body heat to help keep you comfortable, the BedJet forces a quiet stream of air into your bed for cooling and warming. You can use the BedJet with your own bedding, but they recommend you try it with their AirComforter. The AirComforter is like an empty duvet cover with sealable openings. 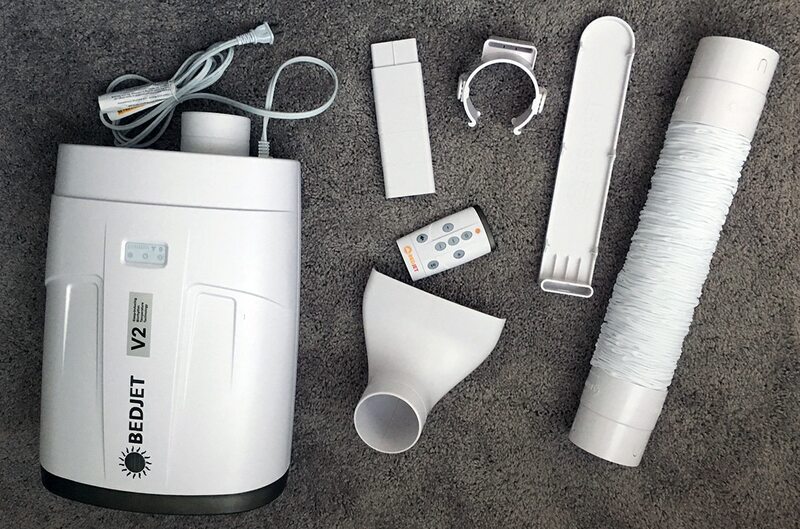 You place the BedJet air delivery nozzle into one opening of the AirComforter and then fill it with hot or cold air. The comforter lays on you like a top sheet would (you use your own fitted sheet) and helps keep you warm/cool without feeling air blowing directly on you. V1 Climate Comfort System: The V1 offers advanced programming of automated cooling/heating settings. V2 Climate Comfort System With Biorhythm Sleep Technology: Identical to the V1 model, but the biorhythm sleep technology is designed to help you sleep longer by allowing you to Program custom heating/cooling profiles all night. It also includes temperature wake-up setting. Note: The BedJet is not a substitute for zero air conditioning in extreme heat. Cooling works best in bedroom temperatures 79 degrees and under. 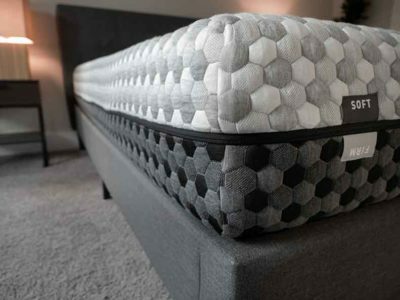 The BedJet and its accompanying products are made by BEDJET LLC, a technology start-up that says they’re re-imagining the bedroom and sleep experience. The BedJet started as a successful Kickstarter project and was also featured on Shark Tank (although it was not funded by any sharks during the episode). After airing on Shark Tank, sales of the BedJet really took off. AirComforter Sheet Accessory: The AirComforter Sheet acts like both a comforter and a top sheet. It is basically an empty duvet cover with openings on the bottom and sides that can be sealed. You choose one side to open and then place the BedJet air delivery nozzle through that opening it so that air can flow into the comforter/sheet. The AirComforter Sheet comes in Twin XL, Queen and King Sizes and in two zones. Single Zone: This sheet works with just one BedJet. It will cool or heat the entire bed to the same temperature (or area under the AirComforter if a Twin XL is used on a King for example). 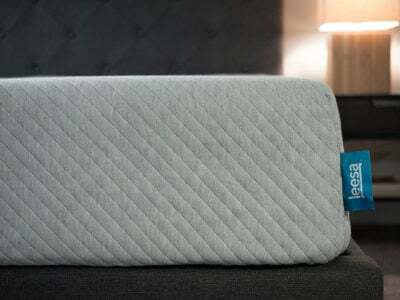 Buy this if you sleep alone, or if you are a couple who enjoys the same sleep temperature needs. Dual Zone: This is ideal for two sleeping partners who sleep differently. The interior cavities are split so that there is a separate inflatable area, one for each side of the bed. Each side can have its own BedJet Air Nozzle. You can use one or two BedJet base units depending on how you and/or your partner like to sleep. 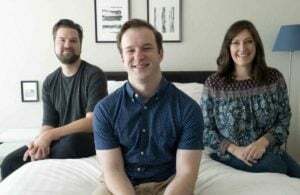 This review is for the V2 Climate Comfort System With Biorhythm Sleep Technology and the AirComforter sheet accessory in a Queen size. Despite the daunting 30-page User Manual, the BedJet was actually very easy to set up and I would highly recommend taking the time to read the manual. It’s not complicated but it is filled with important information about using the product correctly. If you have a bed that is at least 7” off the ground, you can slide the BedJet under your bed. If your bed profile is too low, you can purchase an additional Vertical Mount stand so the product can lay next to your bed. The BedJet base unit connects to a fabric hose that has an air delivery nozzle attached to the other end. 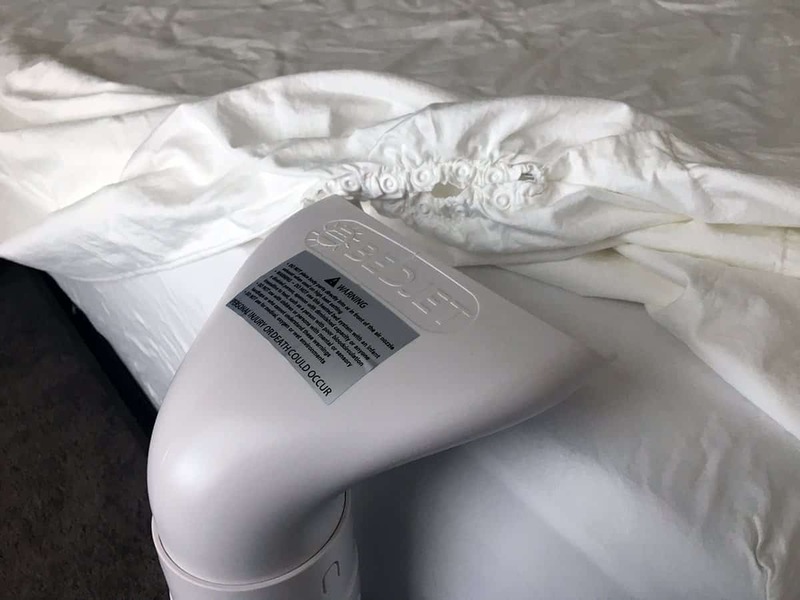 This nozzle lays on top of your fitted sheet and blows hot or cool air onto your bed. You can place this nozzle anywhere around the bed that you like, I chose to place the BedJet on the left corner of my bed (if you are facing the bed). There are two ways to control the BedJet, a remote and an app that you can load on your phone for free. While both devices work well, I found myself using the phone app more often. 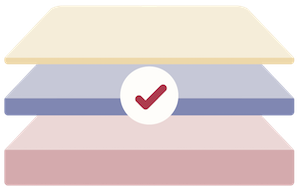 The User Manual will walk you through pairing the app with your device. This is easy to do – you can even name the BedJet unit, which is helpful if you have more than one. 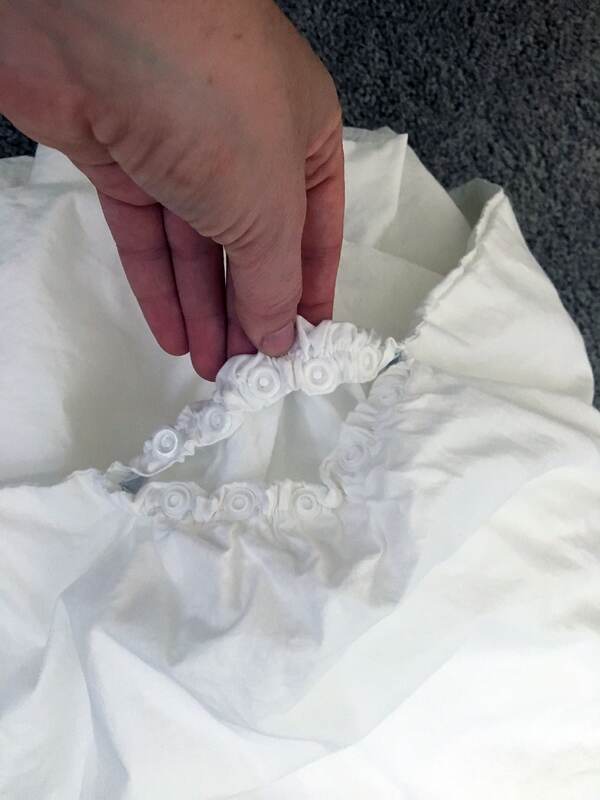 You can place the air delivery nozzle on top of your fitted sheet and place the rest of your bedding over it or you can use the AirComforter sheet. The AirComforter sheet is like an empty comforter/duvet cover with several openings for the air delivery nozzle. 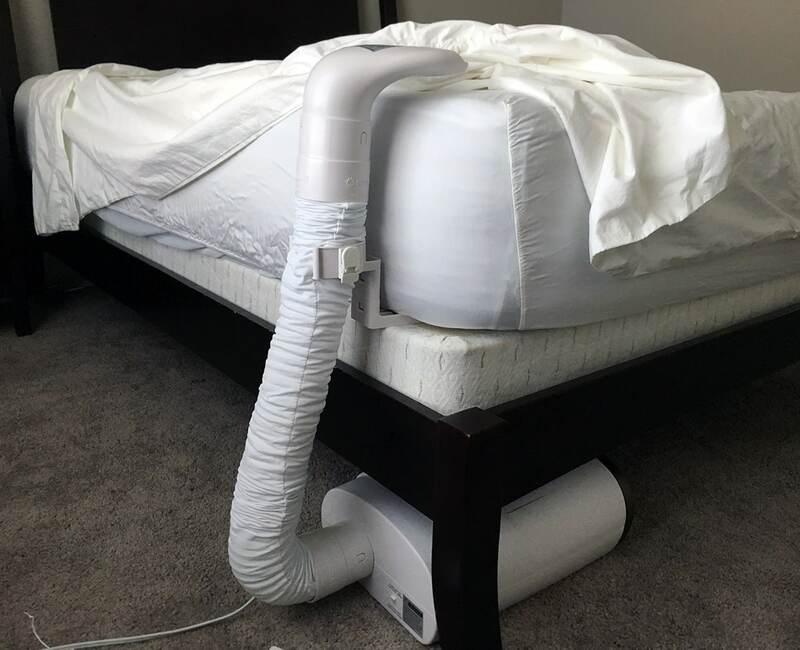 Once you pick which side of the bed you want your BedJet on, you close the rest of the openings and put the nozzle through the sheet so it’s forcing air into the AirComforter. 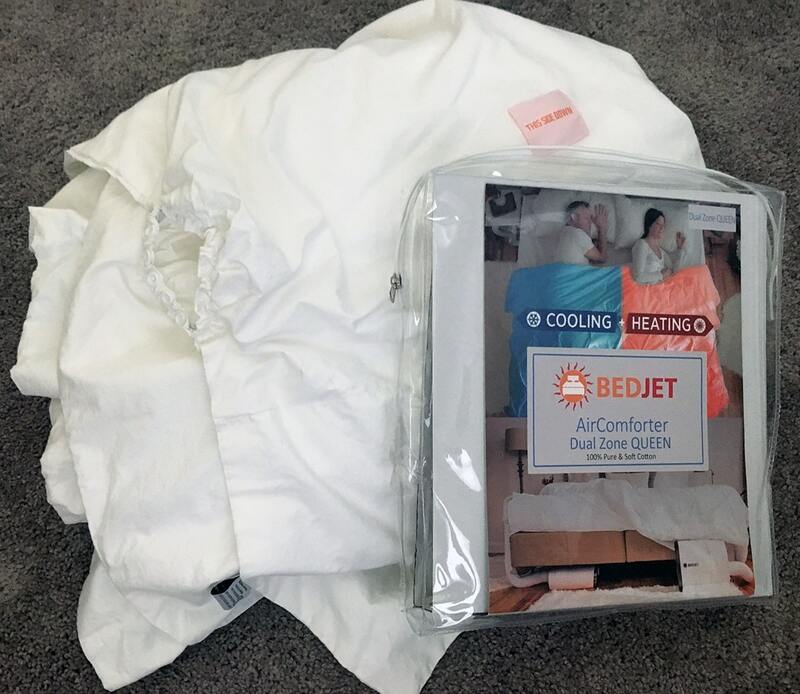 Since I received an AirComforter sheet I used that with my BedJet, and I am glad I did. I replaced this specially designed sheet with the top sheet of my bedding. I made sure all but one of the openings was closed and I put the air delivery nozzle through the opening on my preferred side of the bed. When I turned on the BedJet and used cool air, the AirComforter sheet filled with air and inflated slightly. You can easily place another blanket, comforter or down duvet on top of this or you can use it as your only top layer. The advantage of using the AirComforter is that you won’t feel any air blowing directly on you because the air is being filtered into the comforter. For me, this made for a more comfortable experience overall. One addition the V2 option offers is the Biorhythm Sleep Technology program. This extra feature is designed to work with your natural sleep cycle to help you stay asleep all night. For me, it meant warming up my feet at the beginning of the night to help me fall asleep, cooling me off during the night and then slowly warming me up in the morning. 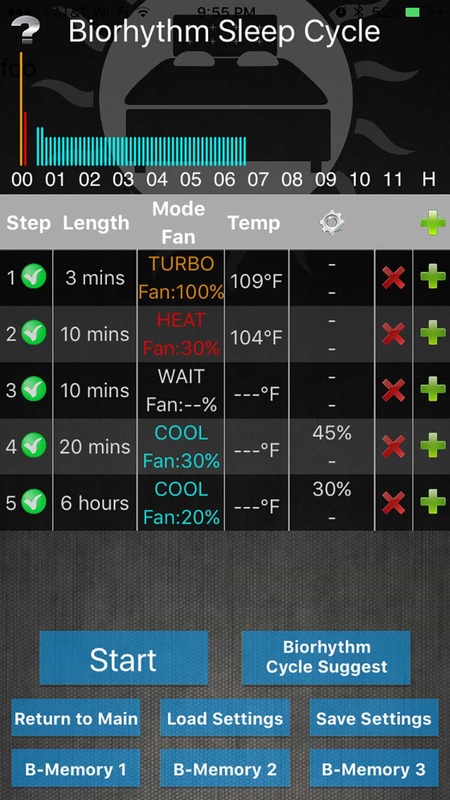 Fan is loudest in Turbo Heat setting, which is only meant to run for 10 minutes maximum. 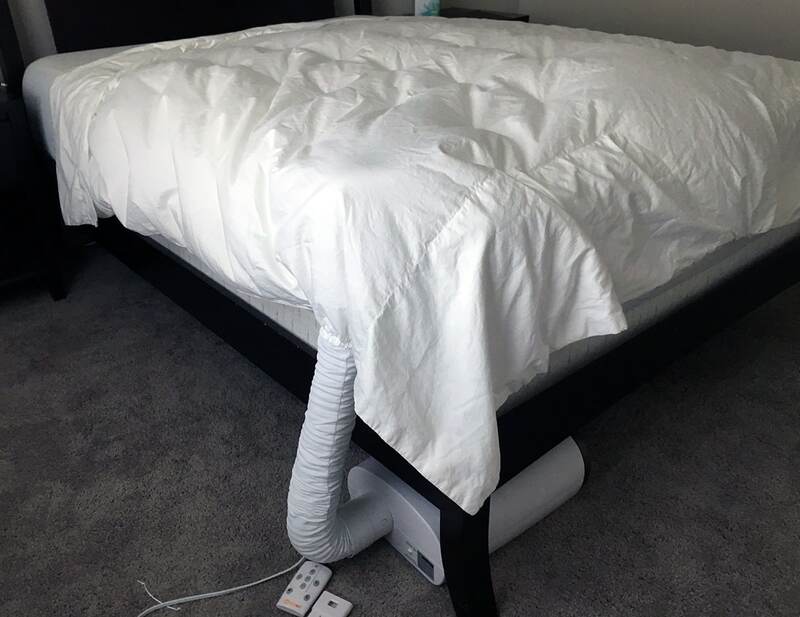 In my opinion, the BedJet provides an innovative solution to a problem that a lot of bedding companies have tackled. The forced air really did keep me cooler/warmer when I needed it. 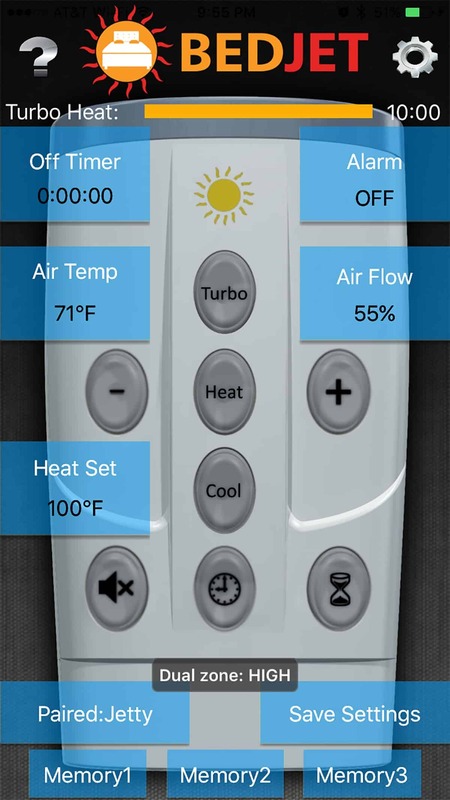 The remote and the phone app were easy to use, even though it did take me a few nights to figure out what airflow and air temperature worked for me. I think that BedJet could be a great bedding supplement, not just for people suffering from night sweats or sleeping cold at night. When I was reviewing the product I got a fever. Being able to instantaneously control how warm and cool my bed was while I was waiting to feel better was so simple and comforting with the BedJet and the AirComforter sheet. 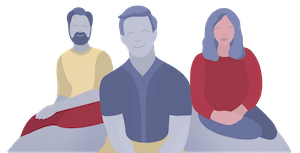 If you purchase the BedJet straight from their website, there is a 60-day “love it or return it” policy that will give you an opportunity to try it out for yourself. Depends on the exact version you get and if there’s any current discounts. Looks like $369 right now.